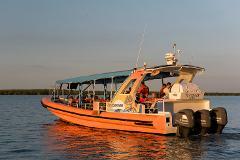 As the sun sets every night in Darwin, Sea Darwin takes to the water to deliver a scrumptious serving of fresh, wild caught Northern Territory fish and chips accompanied with a icy cold drink as you cruise around discovering Darwin Harbour. Darwin's only Bombing of Darwin cruise takes you on journey back in time. Led by local guides with real time commentary, the cruise visits the iconic location that were centre stage during the Bombing of Darwin. From story telling to story living, this double combines Darwin's only Bombing of Darwin Cruise with a visit to the RFDS Darwin Tourist Facility. Darwin's only Bombing of Darwin Tour that takes in the sites by land and sea! With CBD transfers included, this tour takes in Charles Darwin National Park, the Defence of Darwin Experience and a one hour Darwin Harbour Cruise. Turtle Tracks is a sunset odyssey to visit the nesting sea turtles on Bare Sand Island. For those with the spirit of adventure, this 8 hour tour operates on select dates from May to September during turtle nesting season. A gift to make memories! A big day out! Choose local, and travel with Sea Darwin to the famous Tiwi Islands Football Grand Final 2019 and Art Sale. Depart Darwin on the fastest boat at 0900, Sunday 17 March 2019, return around 6pm.